Curious about this situation, I asked him what he was going to cook with his three ingredients?! 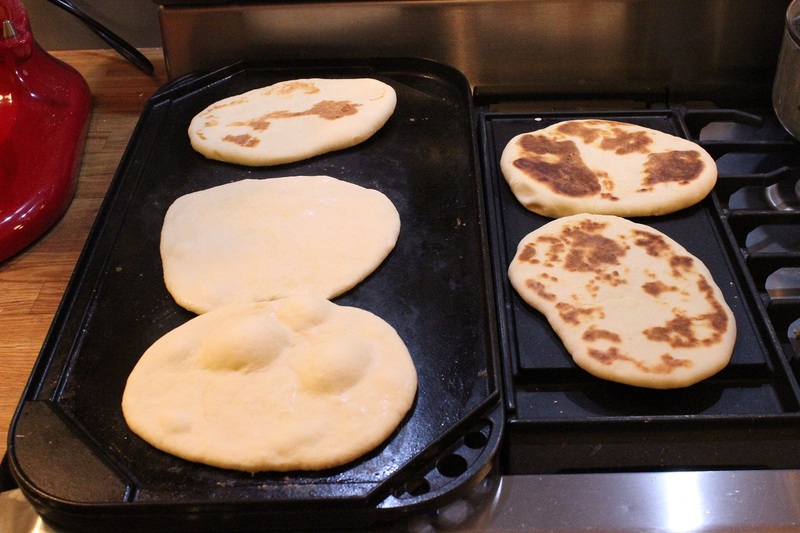 I mentioned that we love cooking and that we just figured out how to make homemade Naan. He then suggested to just crush up some fresh garlic and add it to the Naan. Try for yourself and share your thoughts. 1. Combine milk, yeast, and sugar in small bowl. Cover and let the yeast proof (5-10 minutes). 2. Add yogurt, vegetable oil, salt, baking powder, flour, and yeast mixture into mixer. We used a dough hook and let the mixer combine the ingredients until they formed a dough ball. 3. Let the dough rest and allow to rise until doubled. (If you have an oven that allows proofing, proof in oven). 4. Remove dough and divide into 6 or 7 lemon-sized balls. Add the crushed garlic and briefly knead the dough through to spread the garlic evenly. 5. Roll dough and flatten into a ¼” oval shape. Sprinkle one side with water and gently place the oval shape with the water-side down onto a heated griddle. Let the dough cook for a couple of minutes until it starts to puff and brown on the underside (similar to making pancakes, be patient). Flip the Naan and gook on the other side until golden brown. 6. Serve with Indian meal or eat with dip. Categories: Breads & Baked Goods, In The Kitchen, Soups & Salads (&Sides) | Tags: garlic, home-made, Indian flatbread, Indian food, Naan, vegetarian | Permalink. So last time Hans and I made Indian food at home, we used store-bought Naan to go along with the dish. But why not make Naan from scratch?! Turns out our new blender (a Blendtec) came with a recipe book that included a Naan recipe. We have modified the recipe slightly and made it using a mixer (instead of the blender). It turned out phenomenal. But try for yourself and share your thoughts. 4. Remove dough and divide into 6 or 7 lemon-sized balls. Roll dough and flatten into a ¼” oval shape. Sprinkle one side with water and gently place the oval shape with the water-side down onto a heated griddle. Let the dough cook for a couple of minutes until it starts to puff and brown on the underside (similar to making pancakes, be patient). Flip the Naan and gook on the other side until golden brown. 5. Serve with Indian meal or eat with dip. Categories: Breads & Baked Goods, In The Kitchen, Soups & Salads (&Sides) | Tags: flatbread, home-made, Indian flatbread, Indian food, Naan, vegetarian | Permalink. A few years back, my mom and I were walking through an art fair in Tallahassee, FL and we came across a stand by Neal Pottery. Among the beautifully made pottery was one piece that caught my eye: a small blue round pot with handles. The inside was not smooth but instead featured a spiral. Next to the pot stood a little booklet with bread baking recipes…I was intrigued. After a few questions about the functionality of the pottery piece, in which one can bake a one pound bread. Not so sure if I was sold because of the looks of the pot or the functionality of it. Since the purchase I have used the pottery several times. It works great. I am sure that the recipe below that was inspired by a recipe that came with the pot can be baked in any other baking dish. The bread is small enough to finish it within a couple of days between two people. 1. In a medium sized bowl, combine the yeast, sugar, and water. Cover and allow time for the yeast to “bloom” (about 20 minutes). 2. Add the butter and half of the flour. Work the butter and the flour in with a fork. Add in the remaining flour (it is very dry where we live, so I only used 2 ½ cups flour). Knead the dough for about 3 minutes. 3. Shape the dough into a ball, and place in a greased Neal Pottery bread baker (I used a little bit of olive oil to grease it). 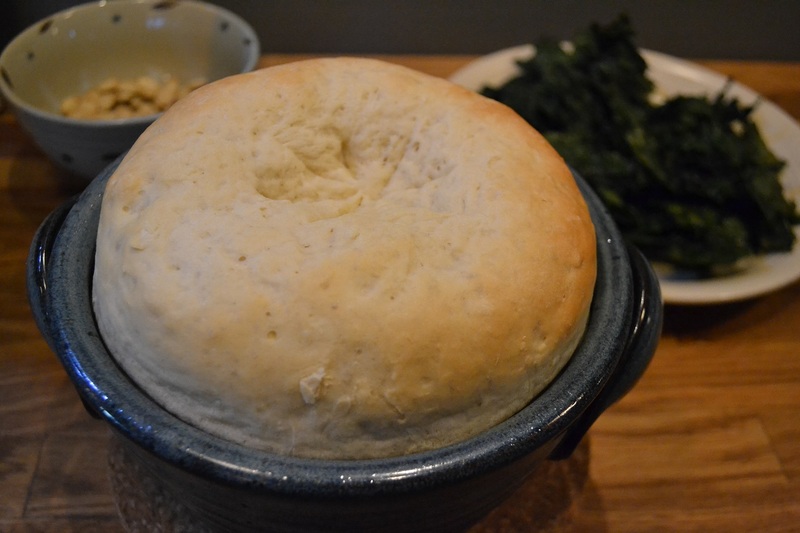 Cover loosely with plastic wrap (also greased) and allow the dough to rise until the top of the dough is about ½ to 1″ over the rim of the pot (approximately 60 to 75 minutes). 4. Uncover and place in a cold oven and bake at 350 degrees for approximately 40 minutes. Carefully remove the bread from the pottery and tap the bottom of the loaf–it should sound hollow. 5. Allow the loaf to cool (on a wire rack, optional) before slicing. Enjoy with jam (we forgot to take a picture 😦 ). Bread also works great to make grilled cheese https://ourfunstuff.wordpress.com/2015/01/24/epic-grilled-cheese-sandwich/. We forgot to take pictures of the bread with black raspberry jam. Here a picture of grilled cheese. Categories: Breads & Baked Goods, In The Kitchen | Tags: home-made bread, vegan, vegetarian, white bread | Permalink. Found this recipe on my computer…it’s been there for a while and I have never tried it. 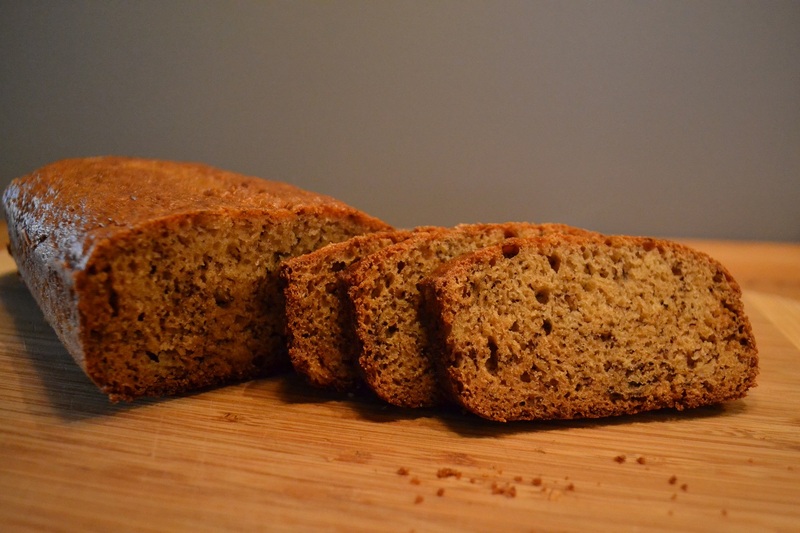 We tried it and it made delicious and healthy little banana bread loaves. Heat oven to 350 F. Lightly grease loaf of pan. (We used a four-mini loaf pan and filled three about 2/3.) Mash bananas and mix with honey, canola oil, and vanilla extract. Stir together flour, baking soda, and salt. Blend the two mixtures and spoon into a lightly oiled loaf pan. Bake for 40 min., or until center is set. Categories: Breads & Baked Goods, In The Kitchen | Tags: banana, bread, honey | Permalink. 1. Heize den Backofen auf 150 Grad Celcius vor. Fette zwei Kastenbackformen ein. 2. In einer grossen Schüssel, vermische das Öl und den Apfelmus. Füge Eier, Zucker, und Vanille Extrakt hinzu. 3. In einer separaten Schüssel, vermische das Mehl, den Zimt, Natron, und das Salz. 5. Backe das Brot im vorgeheizten Backofen für 70 Minuten oder bis ein Messer welches in die Mitte gesteckt wurde sauber heraus kommt. Bemerkung: Schneide die Apfelstücke in ungefähr die selbe Grösse. Es ist best, wenn man die Zutaten für dieses Rezept bei Hand vermischt, vor allem wenn man die Apfelstückchen und Walnüsse hinzu gibt. Categories: Breads & Baked Goods, In The Kitchen | Tags: Apfel, Apfelmuss, Brot, Kuchen, vegetarisch, Walnuss | Permalink. Ich mag Bananen, aber ich bin sehr waehlerisch und esse nur Bananen, die noch nicht zu reif sind. Sobald eine Banane braune Flecke hat, werde ich sie wohl vermeiden. Natuerlich kommt das schon mal vor, dass eine Banana braune Flecken bekommt bevor ich sie gegessen haben. 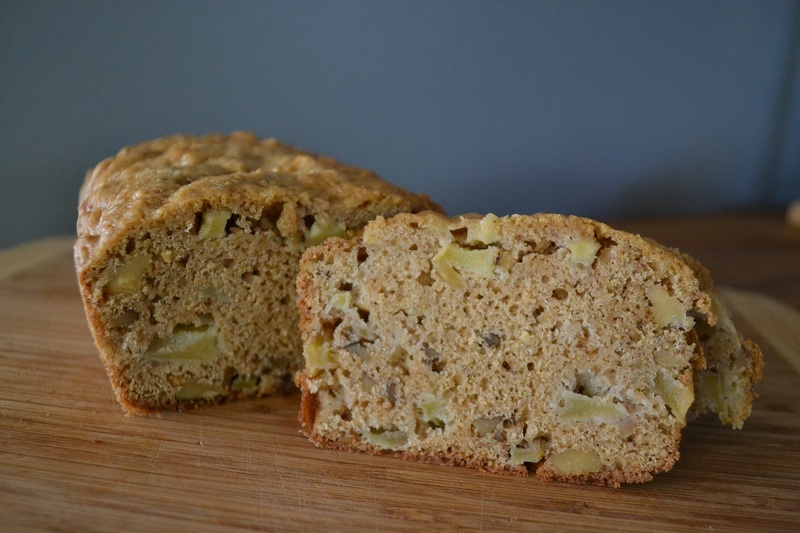 Gluecklicher Weise stellte sich heraus, dass reife Bananen ideal sind Bananenbrot zu backen. Umso reifer die Banane ist, umso suesser ist sie. Man kann auch die Bananen einfrieren und dann spaeter fuer Bananenbrot benutzen. Entferne die Schale vor dem Einfrieren der Banane und reduziere die Wassermenge im Rezept. 1. Heize den Backoven auf 180° C vor. Fette die Kastenform für den Kuchen ein. 2. Vermische den Zucker und die Butter. Gebe die Eier hinzu und rühre um bis alles vermischt ist. Gebe die Bananen und das Wasser hinzu, rühre für 30 Sekunden. 3. Gebe die restlichen Zutaten hinzu. Fülle den Teig in die Backform. Backe bis ein dünner Holzstab, den man zum Test in den Teig steckt, sauber herauskommt (ungefähr 55-60 Minuten). Kühle den Kuchen für mindestens 5 Minuten. Categories: Breads & Baked Goods, In The Kitchen | Tags: Banane, Kuchen | Permalink. I love baking moist breads and vary the recipes so that they remain super-delicious but without all of the added calories these bread recipes commonly have. 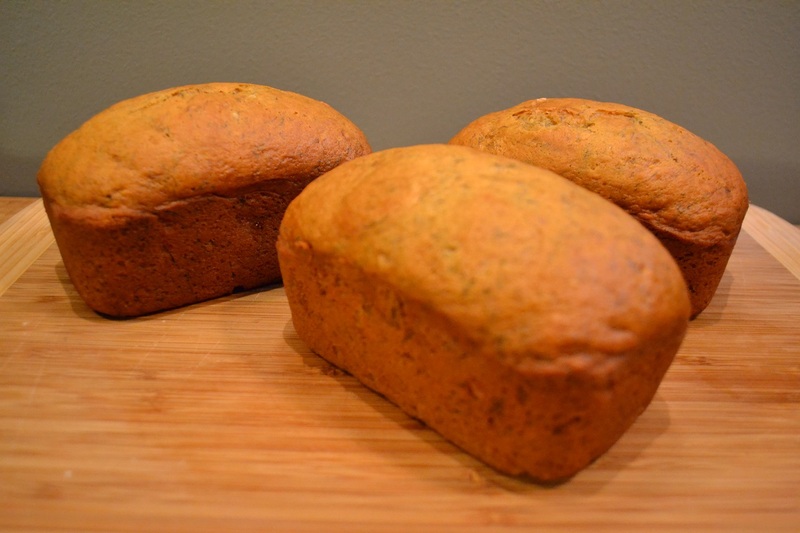 So below you will find our version of delicious and moist pumpkin bread that is both low-fat as well low-sugar. 1. Grease the bottom and ½ inch up sides of two 9 x 5 x 3-inch, three 8 x4 x2-inch, or four 7.5x 3.5 x 2-inch loaf pans; set aside. In a very large mixing bowl beat sugar, oil, and apple sauce with an electric mixer on medium speed. Add eggs and beat well; set aside. 2. In a large bowl combine flour, baking soda, salt, cinnamon, and nutmeg. Add flour mixture slowly to sugar mixture. Beat in pumpkin. The dough should be a creamy batter that is slightly thicker than pancake batter, if necessary carefully add a little bit of water to reach desired consistency. Spoon batter into prepared pans. 3. Bake in a 350° F oven for 55 to 65 minutes or until a wooden toothpick inserted near centers comes out clean. Cool in pans on wire racks for 10 minutes. Remove from pans. Cool completely on wire racks. Wrap and store overnight before slicing. Makes 2 loaves (32 servings). * In our recipe, we replaced half of the normally requested amount of oil with apple sauce. Additionally, we reduced the number of eggs and the amount of sugar. * Pumpkin (even from the can) provides various healthy benefits. 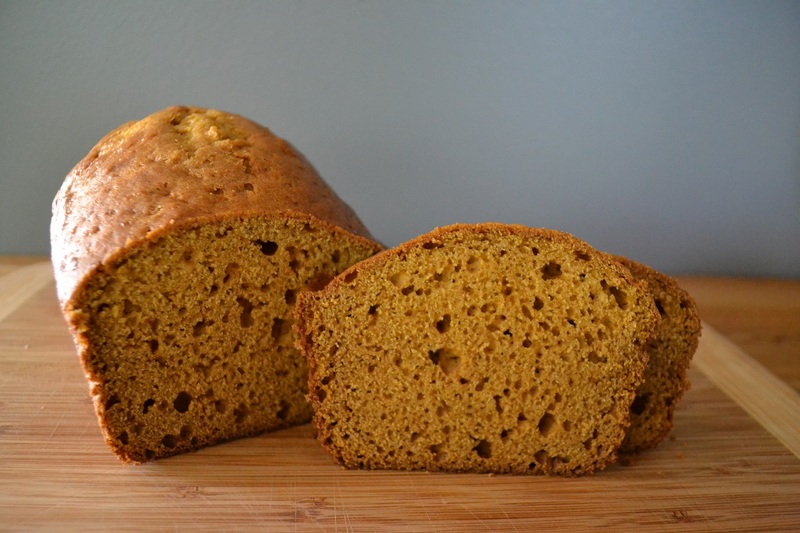 Pumpkin is rich in dietary fiber and also is a great source for vitamin A, iron, and vitamin E.
Categories: Breads & Baked Goods, In The Kitchen | Tags: pumpkin, pumpkin bread, vegan, vegetarian | Permalink.